After a long wait, today The Korean Tech giant officially announced most awaiting the Samsung Galaxy Grand 2. The device was announced about a month ago in India, however during the announcement the company did not reveal the availability and pricing details of this mid-range phablet. This was Samsung’s first phone which don’t relative whole price of the device while making pre-order. Finally the wait for Galaxy Grand 2 was over, as expected that Samsung would launch all its smartphone early this year, well it looks like the wait for the Galaxy Grand 2 is finally over for Indian customers. 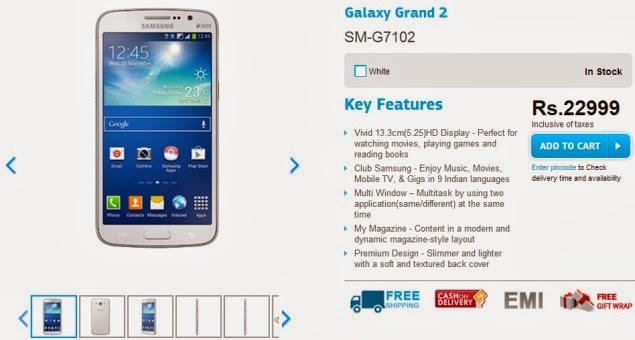 The newly launched Samsung Galaxy Grand 2 is spotting in India and website called as Samsung India eStore also placed price of the device Rs 22,999. Along with some attractive additional offer’s. The company is offering Free Shipping, Cash on Delivery and EMI schemes with new smartphone. From all smart phones lunched last year, Galaxy Grand is most successful one till now. 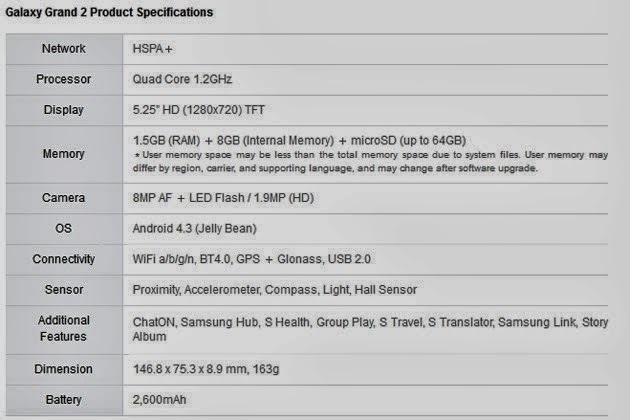 However, the Samsung Galaxy Grand 2 is the successor model of the Galaxy Grand which launched last year. The new Grand 2 device comes up with couple of upgrades in the hardware and software department. The latest Galaxy Grand 2 come with 5.25-inch Display with a resolution of 1280x720P. The smartphone is coming up with Multi-Window feature just like Note 3. One more feature of Note 3 had copied by Grand 2 that’s Faux leather finish which make its look grand and premium.